The federal Maternal, Infant, and Early Childhood Home Visiting, or MIECHV, program has supported high-risk families in communities across the country through intensive home visiting services since 2010. MIECHV provides federal funds to support programs that connect families with trained professionals—often nurses, social workers, or parent educators—who help parents acquire the skills they need to promote their children’s development. The majority of MIECHV funds—75 percent—support evidence-based home visiting services that have been rigorously evaluated and have proven to be effective strategies for improving outcomes for families and for saving public resources over the long term. Every grantee is expanding evidence-based home visiting services to more vulnerable children and families in high-risk communities. MIECHV provides additional resources to bolster existing services where home visiting was already an established program and create statewide infrastructures to introduce home visiting where it was not available. Using needs assessments, grantees identified the most high-risk populations and are directing resources to expand home visiting within these communities. To ensure families receive the full benefits of participating in home visiting programs, they must remain engaged throughout the curriculum and complete the appropriate number of visits with their home visitor. Many grantees use MIECHV funds to identify strategies to improve program retention and ensure that families achieve positive outcomes. Many state and tribal grantees use MIECHV funds to support the establishment of systems within home visiting communities and across services that support children and families. Grantees create processes and relationships to integrate the various home visiting services available, ensuring that families receive the best services to meet their needs. Additionally, grantees are building relationships with other community service agencies in order to provide more effective referrals and integration of the continuum of services. MIECHV funds enable grantees to provide technical assistance and training to support home visiting staff in providing the most effective services possible and ensuring that quality standards are being met. Professional development provided with MIECHV funding strengthens the home visiting workforce and extends its capacity to deliver high-quality services to children and families. MIECHV legislation requires participating states to collect data that demonstrate improvements on established benchmark areas. Grantees use MIECHV funds to develop data infrastructures in order to gather the required data and report on progress toward the benchmarks. These investments enable grantees to be more efficient in their data collection and analysis and to increase the competencies of the broader home visiting community to use data for program improvement and evaluation. Many states highlight collaboration facilitated by MIECHV funding as a success of the program. This can be seen at the program level in collaboration across home visiting models; at the state level in which multiple agencies work together to implement the grant; and at the federal level in which grantees work across state lines to identify best practices and provide communities of support. Many grantees leverage MIECHV funding to develop centralized intake systems—also referred to as coordinated intake systems—which are collaborative approaches to engaging, recruiting, and enrolling families in home visiting across programs and organizations. Centralized intake systems help programs better identify and serve their at-risk populations by connecting families to the home visiting model that will best meet their needs and streamlining the referral process. Since MIECHV places a high value on evidence-based programs, the grant increases the reach of the most effective home visiting services. Grantees use MIECHV funds to ensure that they implement models with fidelity by incorporating continuous quality improvement, or CQI, and ongoing evaluation into their implementation. Grantees are also using MIECHV to evaluate promising practices and develop an evidence base for new home visiting models. As a result of the MIECHV program, grantees achieve a broad range of innovation. States utilize funds to establish many unique and interesting enhancements, programs, and initiatives related to service delivery, systems development, training, incorporation of technology, and more. The design of the grant programs allows states the freedom and flexibility to be creative in how they achieve the results intended by the grant. Each grantee acknowledges the tremendous value that MIECHV adds to infrastructure for home visiting services. However, the implementation process has not been without challenges. Grantees identify the rapid timeline for development and implementation as a significant challenge, along with the burden of tracking and reporting on the required benchmark data. Finally, the sustainability of the program is of particular concern and has inhibited some grantees from planning for the long term. Over the past five years, MIECHV grantees have built home visiting systems that reach some of the most vulnerable children and families in the country. 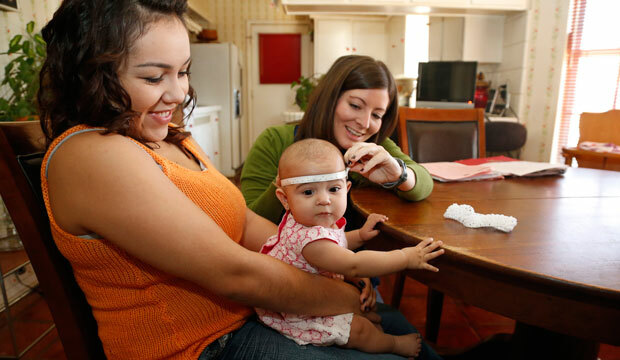 MIECHV provides critical support to home visiting programs across the country; continuing this investment and ensuring its sustainability would allow state and tribal grantees to continue expanding services to new communities and other underserved populations, as well as help sustain the outcomes achieved thus far. Moving forward, grantees elevate the need for more collaboration and communication among federal, state, and tribal administrators, as well as opportunities for more feedback and information sharing among MIECHV grantees. States are realizing many successes and achievements that could benefit other states that are tackling similar challenges or hoping to implement comparable programs. In the near future, Congress must reauthorize the MIECHV program at current funding levels to ensure that grantees are able to maintain and increase service capacity and continue to support ongoing systems-building work, professional development, training and technical assistance, and the many successes of MIECHV. Additionally, federal legislators should consider making the MIECHV program permanent to provide sustainable funding for effective policy that produces significant results for the children and families who benefit from high-quality home visiting. Stephanie Schmit is a Senior Policy Analyst with the Child Care and Early Education team and Legislative Coordinator at the Center for Law and Social Policy. Christina Walker is a Policy Analyst with the Child Care and Early Education team at the Center for Law and Social Policy. Rachel Herzfeldt-Kamprath is a Policy Analyst with the Early Childhood Policy team at the Center for American Progress.